เลือกรูปแบบการเข้าสายได้ทั้ง – Tension-Clamp, Screw terminal หรือ Euro terminal. 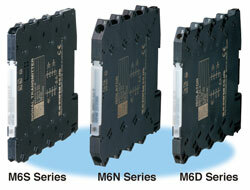 As many as sixteen M6D/M6S modules can be mounted tightly side by side in a space of 9.5 centimeters (3.75 inches). In order to save you from individual power input wiring, the Installation Base holding eight modules can be expanded up to six bases for the maximum of 48 modules supported by a common power supply. Selectable connection styles, a wide varieties of I/O signal ranges, low power consumption, 2000 Vac isolation together with CE and UL, make the M6 Series ideal as standard for use in a wide range of industrial and commercial machineries. Presently approved products are as listed below and more new, approved products will follow.